My name is Angelica Lovato. I live in Questa, NM. I am 14 years old, and I am going to be a freshman at Questa High School. I have always really enjoyed science, and my middle school science teacher is the one who referred me for this internship. She saw that I show a lot of interest in the field of science and that maybe I would be able to learn a lot through this internship. I was very excited when she told me that she’d thought I’d be perfect for the job. The reason I really decided to apply for this internship was because it truly sounded interesting to learn more about the watersheds in my small beautiful town. It also let me get outside and explore and understand nature a little more. I also really like chemistry so I was excited to test and sample the water quality of the streams. On the first day of the internship we took a walk around Fawn Lakes and learned how to mark problem areas on a GPS. We marked issues like erosion and noxious weeds. We then did a cross section and learned how to take laser level measurements. We also took a particle test, which measures the strength of streamflow by observing the size of particles transported by the water. We did this by randomly measuring the diameter of 100 particles in a certain area near our cross sections. After that we got to fly a drone to take videos and pictures of the lake, river, and most significant erosion issue at Fawn Lakes. 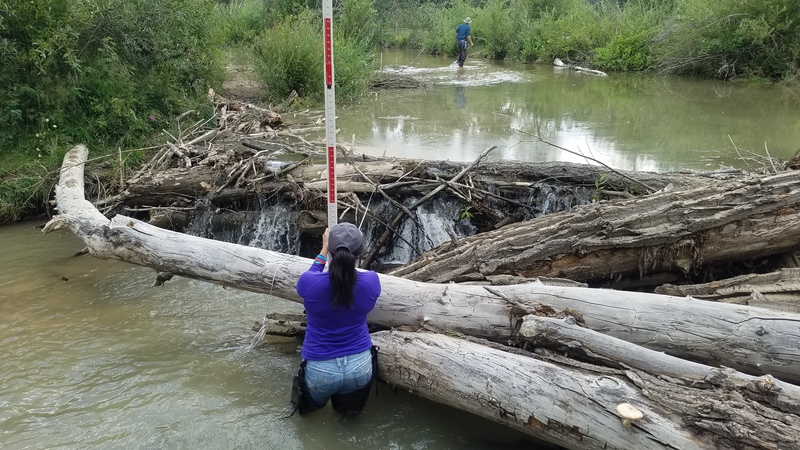 We were able to do a riparian survey which had us assess the area along the river bank, specifically the vegetation diversity, amount of ground cover, and animals like aquatic insects which indicate good or poor water quality. That helped me learn that streamside vegetation is important because it can create s hade (a canopy) for the water which will help it keep cool. It also is a source of erosion control, to slow down or even possibly stop erosion from affecting the river. The next day we got to test water quality at Junebug, Fawn Lakes, and Eagle Rock, which was my absolute favorite, besides the drone flying, which was amazing as well. We learned how to take temperature of the water, TDS (total dissolved solids, a measure of salinity), pH, dissolved oxygen, turbidity, the color, and how much phosphorus and nitrate were in the streams. I really enjoyed this because once they showed us how to do it at Junebug, we were able to do most of it by ourselves at Fawn Lakes and Eagle Rock. It was very hands on and I enjoyed it quite a bit. 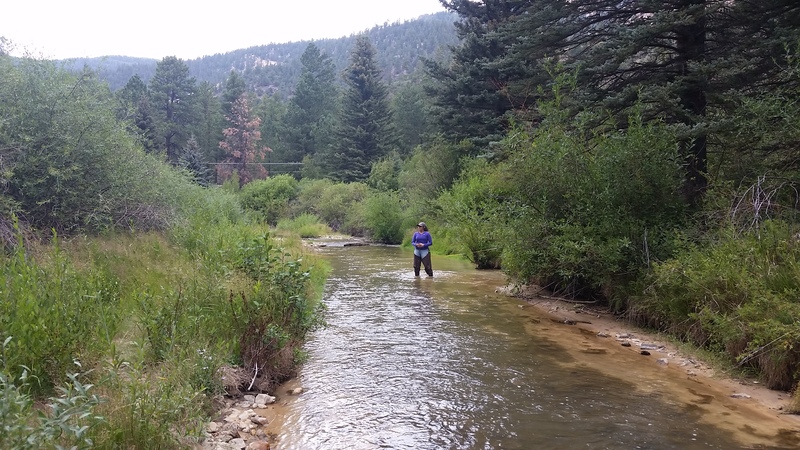 We tested streamflow by measuring how quickly a floating device can go through 10 feet of stream. We then did calculations later in the internship and were able to find how many cubic feet per second the stream was flowing. One other thing we did was sample benthic macroinvertebrates in each stream. We got to see Stoneflies, Mayflies, Caddisflies, Water snipes, Riffle Beetles, Craneflies, Blackflies, Midges, and some Aquatic Worms. It’s important to see and identify the types of insects in each stream because some of them are pollution sensitive, and if you find those species in a stream then that means the stream is healthy. These last three days we’ve done a longitudinal profile at Fawn Lakes. That required the laser level measuring again, which was very interesting to learn how to do. 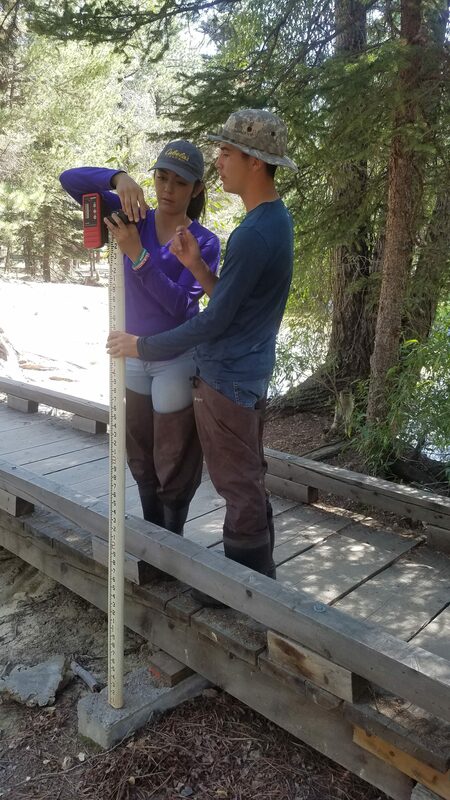 Throughout that we also measured and estimated the width of the river and the percentage of different types of sediment in each riffle and pool. We then did two more cross sections at Fawn Lakes and across from Elephant Rock. 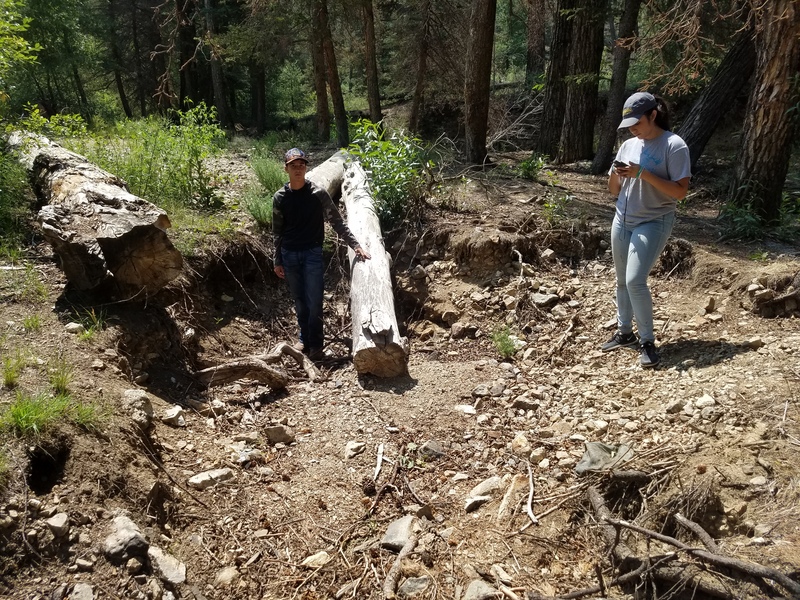 We also walked around every site and marked some areas where students like us and volunteers could help with issues like erosion and noxious weeds, using Citizen Science protocol. We flew the drone again for videos and pictures of the lake and river at Eagle Rock. We found some areas where we could possibly place a Picture Post which will help collect data at Eagle Rock throughout the years. 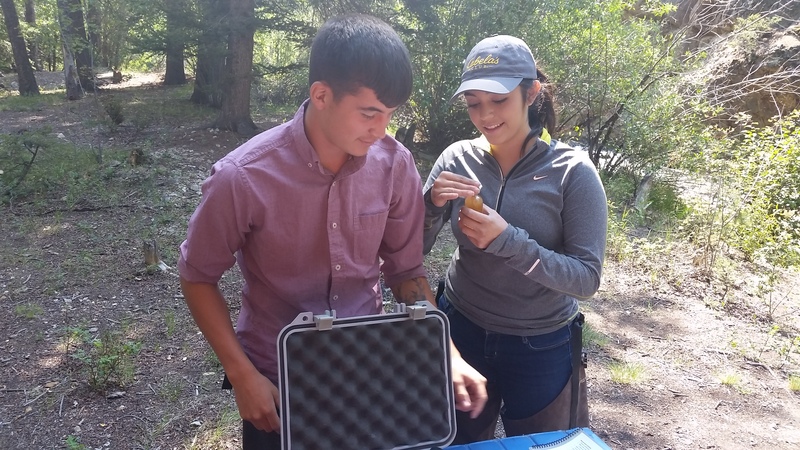 Lastly, we tested the stream canopy cover, took a few more particle tests, and then finally analyzed all the data we collected throughout the internship. I learned a lot at this internship, a lot of things that definitely will help me in life. First of all, the work we did could be part of a career that I definitely would like to take into consideration. I enjoyed everything we did and I would definitely enjoy doing it all again. Another thing it helped me with is understanding how I can be a steward to the land and to this lovely community I call home. I learned different ways I can help the environment around me so that many generations after me can enjoy these lakes and rivers. Also, I learned about ways to help give animals that live here a better, healthier, and safer home. I would like to thank Rich, Carlos, and Emily at River Source for giving me this amazing opportunity to be a part of this internship. Also, a big thank you to the US Forest Service and The McCune Foundation — all of this wouldn’t be possible without you.